After a week of foodie adventures and fun in North Carolina for the first part of my spring break, I now begin the second leg of my journey- Ohio. Flying from Charlotte to Cincinnati to visit my grandparents, I couldn't wait to get my second chance to explore around the city and see what delicious eats I could find (see past reviews from Cincinnati here). Arriving mid-day, I searched for an interesting place for dinner, and was directed towards Nada from a family friend and Find Me Gluten-Free. Located in a prime location downtown, Nada is easy to get to, and made for an ironic choice to dine at on Saint Patrick's Day. 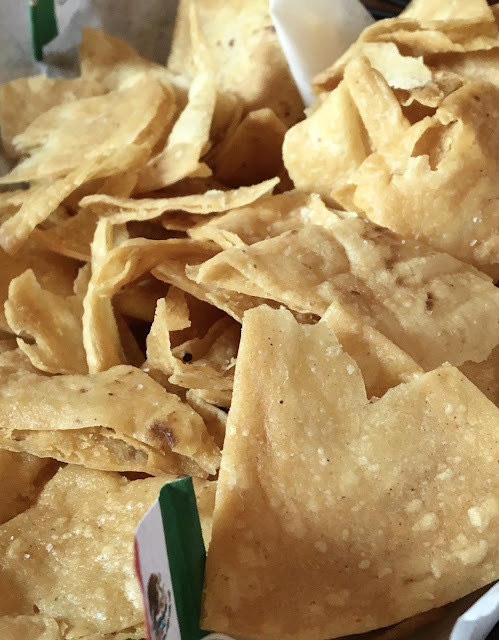 Lured by the promise of tacos, guac, and chips, some of my favorite foods, I decided Nada would be the perfect entryway into the Ohio stretch of spring break. Arriving early into the dinner hour, we were greeted by friendly staff and shown to a table on the restaurant's second level- with a great view of the city below. Settling in, I was excited to see what gluten-free eats were in store. Before looking over the (relatively) short menu, I let my waiter know that I was gluten-free (due to medical reasons) and dairy-free. Unfazed, he wanted to check with the kitchen before letting me know what would or would not be safe. Returning shortly, he said the kitchen could individually fry chips so that my family could enjoy an appetizer of chips, salsa, and guac. Because of willingness to accommodate and create special food just for me, I happily assented to the appetizer, and took advantage of the extra time to look over the menu. The chips were clearly fresh and fried to perfection. Thick and crunchy, they were exactly the chips I love, leaving all store-bought versions in the dust. They stood up well to dipping, and had a nice golden corn taste. The salsa was smokey and featured fire-roasted tomatoes. Not bad, I am more of a pico de gallo salsa fan, so it was not my favorite salsa I have ever eaten. The guac however was amazing. Creamy, limey, and slightly chunky, the guacamole appealed to my Goldilocks-like pickiness when it comes to guac. Sliced veggies provided another vehicle for consuming it, in addition to the chips, and both performed equally well. From the ten taco varieties on the menu, the only ones that are not gluten-free are the Baja fish and crisp pork belly. Everything else is, or can be modified to be gluten-free. I went with the chicken tacos, which are topped with pico, guacamole, and pureed black beans. These tacos are made dairy-free sans cheese and gluten-free modification is made by swapping flour tortillas for corn. I absolutely loved the tacos. Fresh, flavorful, and in perfect flavor harmony, these totally defied my expectations. The tender, spicy chicken was portioned generously, and cut into bite-sized, easy to roll pieces. The pico was fresh and flavorful and the black bean pure added a taste of black beans that was not too overwhelming. 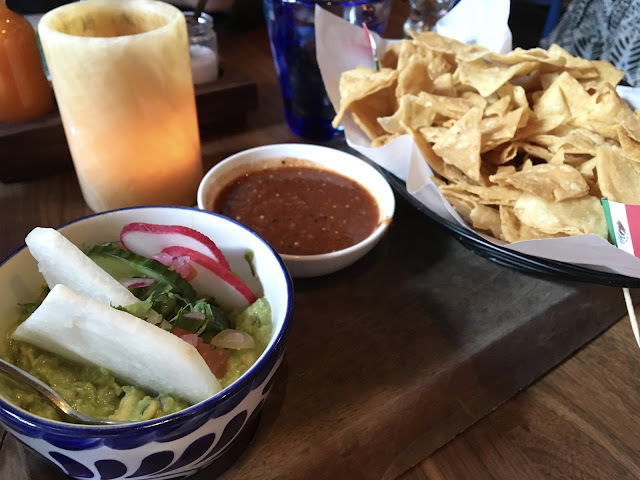 While those components were delicious, the guacamole again stole the show- providing a limey burst of flavor and creamy texture. 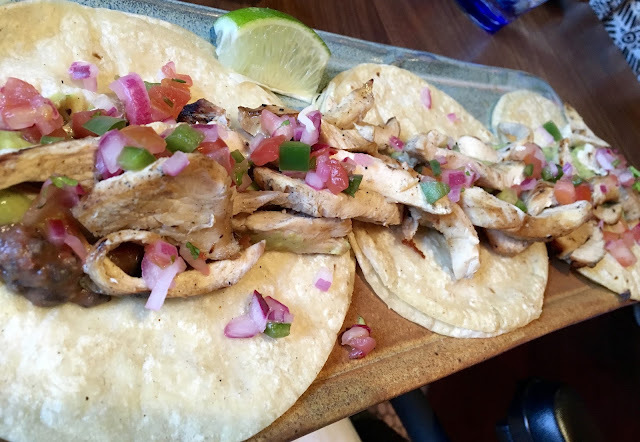 I've had a lot of tacos in my time as a gluten-free blogger, but these definitely are in the top tier of tacos I've tried. Overal Nada was a total win for me. I was not expecting top notch tacos in Cincinnati, but was happily surprised by the top quality and eager willingness to accommodate my dietary restrictions. The staff were friendly, and the vibes were cool. This is definitely a restaurant worth pairing with a show at the performing arts center next door or a stroll through Downtown to see what's going on in Fountain Square a few blocks away. Although I don't know when I'll next be in the city, I definitely would put Nada on my to-do list for another visit.